Mix all of the dry ingredients except the chocolate chips together in a large bowl. Add peanut butter and stir until the mixture is well combined (I like to use my KitchenAid mixer with paddle attachment for this; before I had one I just used my hands). Add the honey and vanilla and mix again. 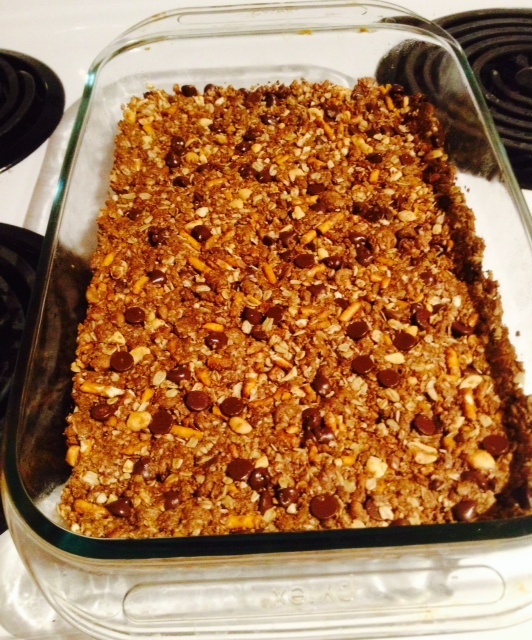 You may need to add more honey if you feel like the mixture won’t stick together to form the bars. Stir in the chocolate chips. Spray a 9×13 baking dish with cooking spray and press the mixture firmly into the dish, packing it down well. Bake for 15 minutes. Let cool completely before cutting. As mentioned above, these aren’t very chewy so they can be a bit crumbly when cut. Enjoy!